For the past week and a half we have been searching our courtyard, looking for chrysalises of Monarch and Queen Butterflies. We figured they would be hatching soon, based on the timing of the chrysalis we found in our courtyard last year (which hatched 10-12 days after the caterpillars disappeared). 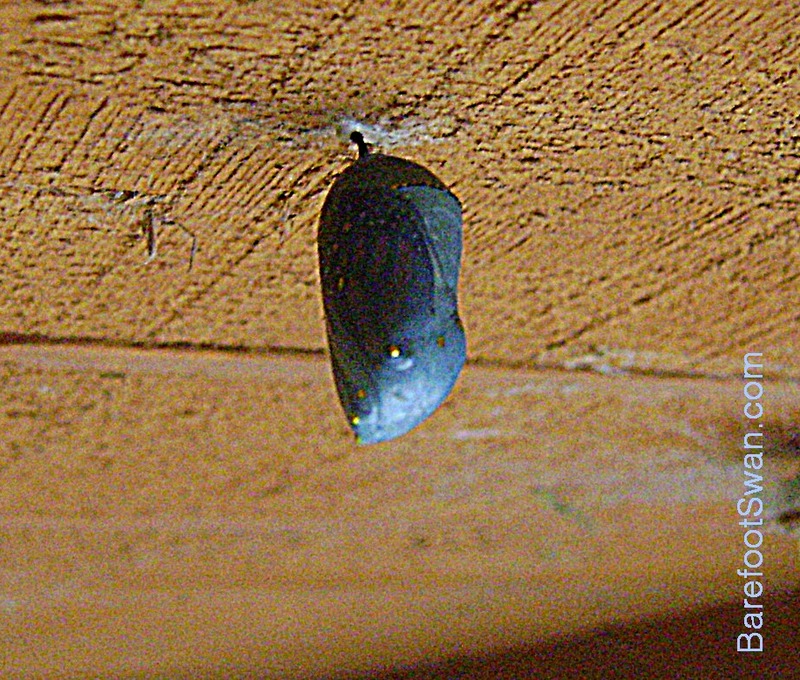 Yesterday afternoon (Thursday) we found one chrysalis - on the underside of our patio cover, in plain view right over our heads. It had already changed color from lime green to blue, so we knew it would be hatching soon. We moved a nearby hummingbird feeder away from the chrysalis so the hummers, finches, woodpecker and oriole wouldn't bother the soon-to-hatch butterfly. By Friday morning the chrysalis had turned black. We knew the butterfly was getting ready to emerge so we checked it obsessively every 15-20 minutes. 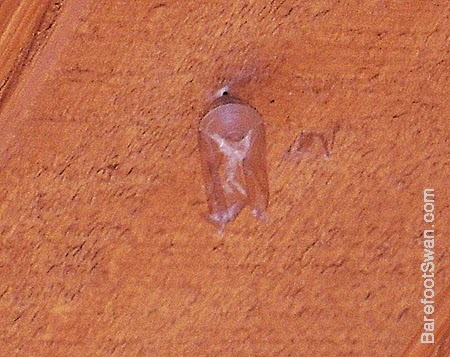 We could just see the butterfly inside the chrysalis. It didn't take long for the actual hatching process. 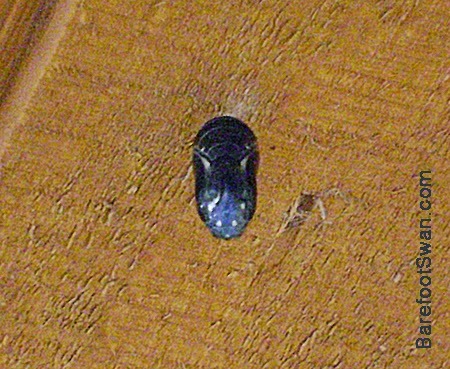 At 10:25am we had a black chrysalis. 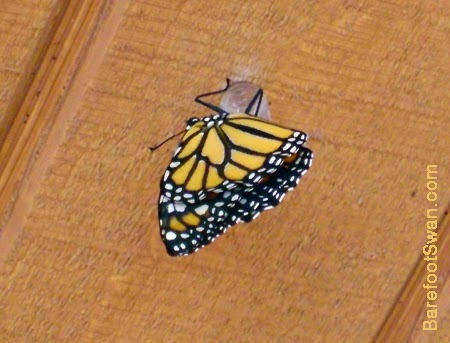 When we checked back at 10:45am the butterfly had completely emerged from the chrysalis. We sat on the porch under the Butterfly, enjoying the spring morning and watching as it occasionally made some tentative side-to-side stretches and slight wing flexes. At times it would unfurl its proboscis, but it mostly sat quiet and motionless as its wings became stronger. 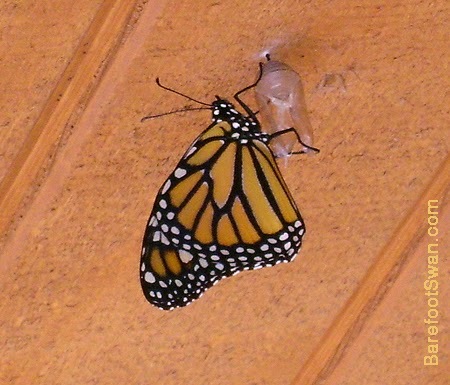 About 2-1/4 hours after emerging from its chrysalis, the Butterfly started doing full wing flexes. A half hour later, it took its first flight. That first flight was pretty short: straight down. 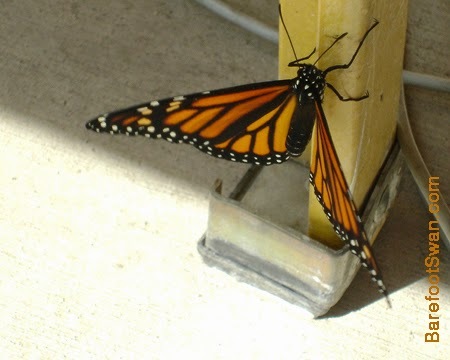 It managed to land on its feet, and immediately started crawling up the step ladder we had been using to take these pictures. 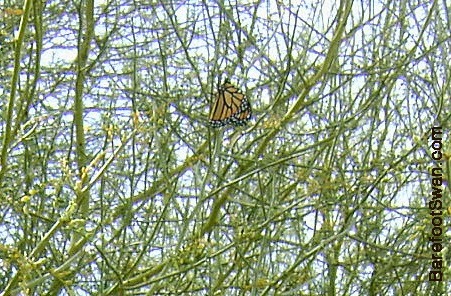 After a few minutes resting on the ladder it took flight again, this time to the palo verde tree. It rested again, sitting quietly in the sun. The next short flight took it over to our Sweet Acacia tree where it again basked in the sun. Finally it flew up high into the top of the Desert Willow tree. 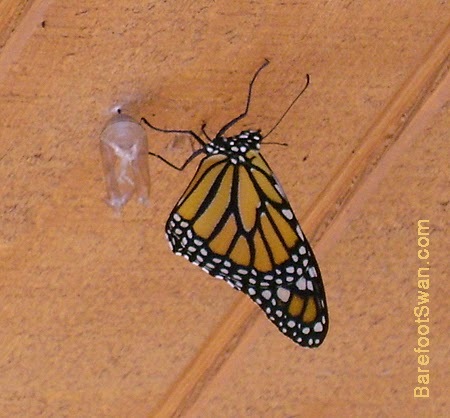 It was amazing to watch this butterfly emerge from the chrysalis and begin its new life as a winged creature. 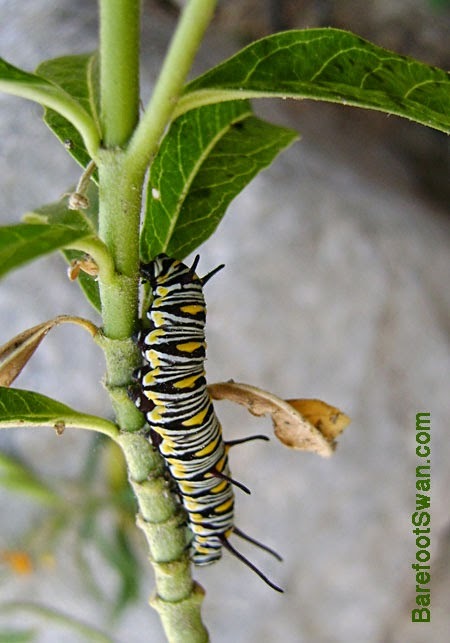 The process of metamorphosis - from caterpillar to a butterfly - is truly incredible. How in the world do all those parts get rearranged? And what goes through the former caterpillar's mind when it wakes up transformed??? This butterfly will only live a few weeks. During that short time it will hopefully avoid cold weather, birds, predatory insects, rain, strong winds, spider webs, car windshields, insecticides and kids with butterfly nets. It will need to find shelter, nectar plants, mud puddles - and a mate - as well as a safe place to lay eggs so the next generation of caterpillars will have enough food when they hatch. Backyard habitats make an important contribution to the survival of these and many other creatures. They create safe havens that also act as stepping stones between fragmented natural habitats. 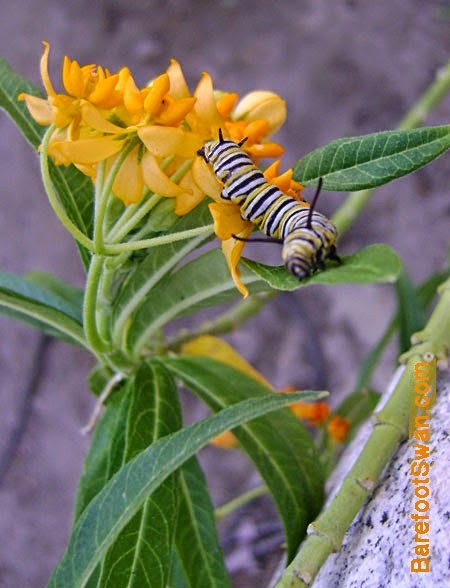 Something as simple as planting a milkweed plant can make a difference. 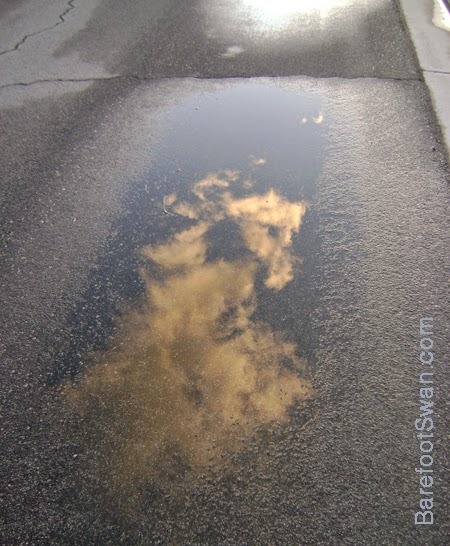 We had some light rain last night. Dropped our daytime temperature back down into the 60's. Lots of birds activity on our morning walk - Bewick's Wren, Northern Mockingbird, Verdin (pair), Abert's Towhee, American Kestrel (pair), Mourning Dove, Eurasian Collared-dove, Great-tailed Grackle, Rock Pigeon, Black Phoebe, Say's Phoebe, Anna's Hummingbird, Ladder-backed Woodpecker, Common Raven (pair), House Finches. White-crowned Sparrows are still lingering here. When they head north we'll know the summer weather is getting close. The rain will help our Butterflyweed recover from its recent munching by the Monarch and Queen butterfly caterpillars. The plant is already putting out new leaves after being thoroughly decimated a week ago. 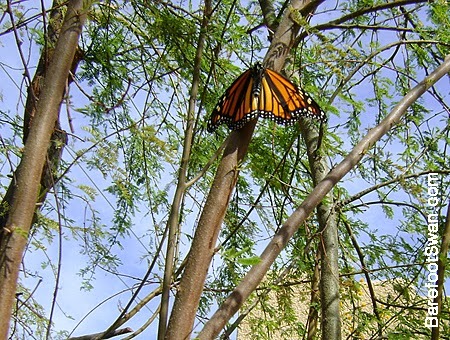 We saw some Queen Butterflies on our other Milkweed plant a couple of days ago. If they laid eggs, we should have another round of ravenous caterpillars soon. "When I was a kid, being outside was the norm. Rain or shine, our parents would tell us to get out of the house." 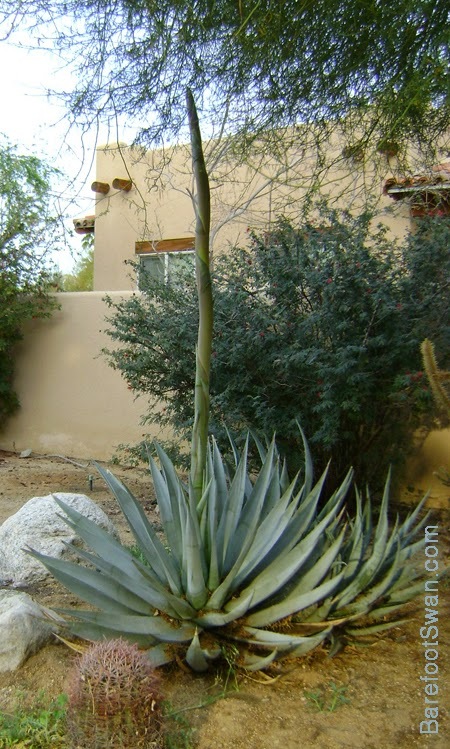 The agave flower stalk is still growing like crazy. Mid-week it was 66 inches high, from base of the plant to the tip. This afternoon it measured 80 inches tall - over 6-1/2 feet! It has grown more than 4 feet in 7 days, or nearly 7 inches a day. 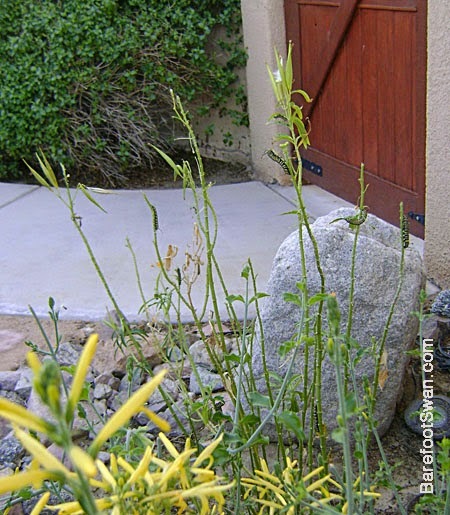 We had to trim the palo verde tree branches above the flower stalk, to give it room to continue growing. 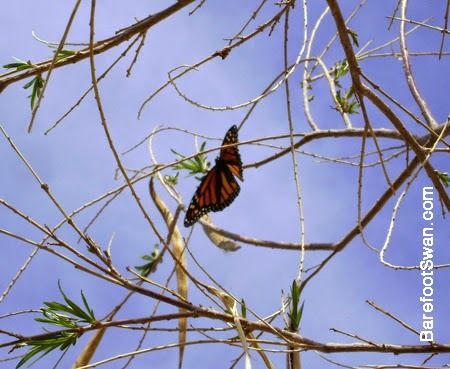 The Monarch and Queen caterpillars have all vanished - the last we saw any of them was Sunday 2/15. We have checked the milkweed and butterflyweed plants, and tried to find them inside the yellow chuparosa bush. If they have already transformed into their chrysalis stage, they are so well camouflaged that they will be extremely difficult to find. The only reason we found the chrysalis last year was because we saw a caterpillar on the bush just as it started to change. Even knowing its location, it blended in so well with its surroundings that it was difficult to re-find each time. So somewhere in our yard we (hopefully) have at least 22 caterpillars dreaming about flying. If the timing is the same as last year, they should be hatching in about 10-12 days. "Flying dreams mean that you're doing the right thing with your life." Our yard landscaping design is pretty informal. 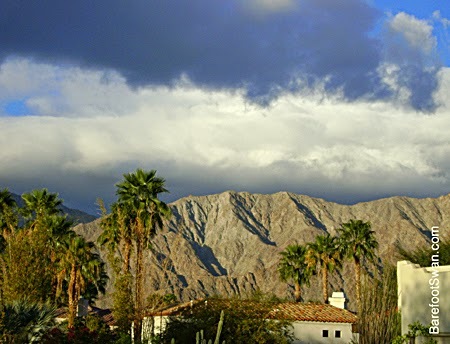 Nearly all of the plants are desert native. Some have been purchased but many more are rescues, or volunteers that appeared on their own or have reseeded from existing plants. 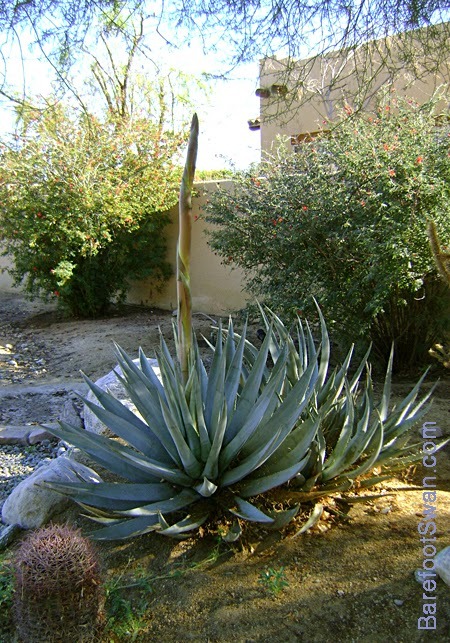 One of our plants is a native Desert Agave (Agave deserti) that we rescued many years ago from a construction site. It had been bulldozed off an area of cleared land, and left in a pile of debris destined for the dump. We brought it home, trimmed the damaged leaves, potted it and nursed it back to health. Eventually it recovered and we planted it in our front yard, where it has flourished and produced many sucker babies from the base rosette. Within the last few days the main plant has started to produce a flower stalk. 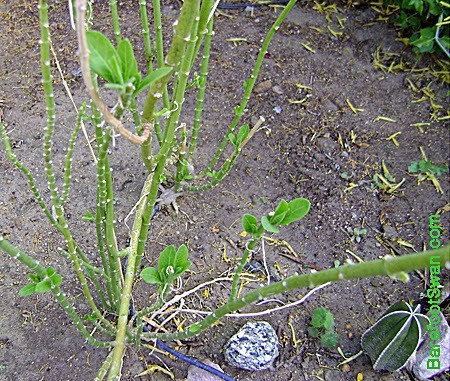 The stalk is presently about a foot taller than the plant, but it is growing in height rather quickly. Various species of agave grow throughout the desert southwest. They have historically been an important source of food, medicine and fiber for many Indian tribes. 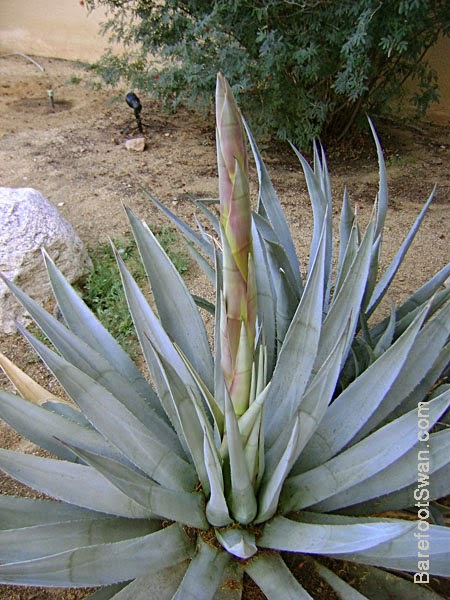 The plant additionally is a source of beverages including the fresh juice ("aguamiel, or honey water), a fermented brew ("pulque") and the more potent mescal. 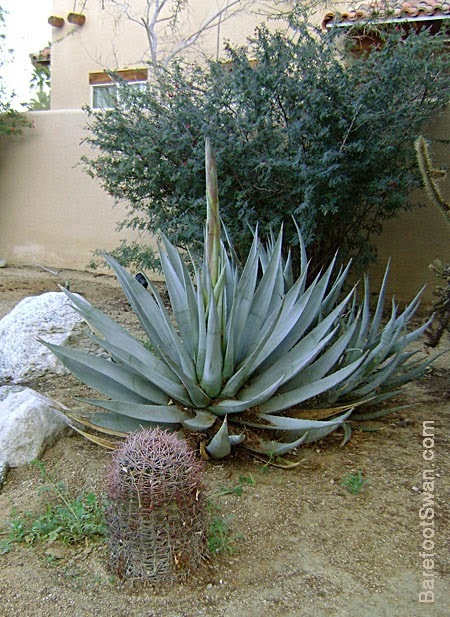 Only one species of agave, Agave tequilana, is used to produce Tequila. 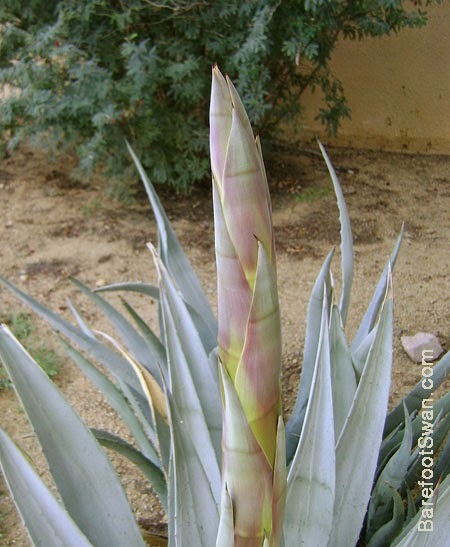 Agaves flower at maturity, or about 20 years on average. The base rosette will die after flowering, as it uses all its stored energy to produce this massive flowering stalk. This agave has suckers growing from the base of the original plant. So the parent plant is able to reproduce both through its one-time seed production and through the clones that will continue to grow after the parent plant dies. It will be interesting to watch this flowering stalk as it develops and eventually blooms. Over the last few days the Golden Butterflyweed in our courtyard has been eaten down to stems and seeds by our Monarch and Queen caterpillars. They have nearly tripled in size since we first found them last weekend. With the foliage gone from the Butterflyweed, it was a lot easier to count the caterpillars. We found 20 of them at last count, all Monarch. The Queen caterpillars wandered off before the plant was completely eaten. 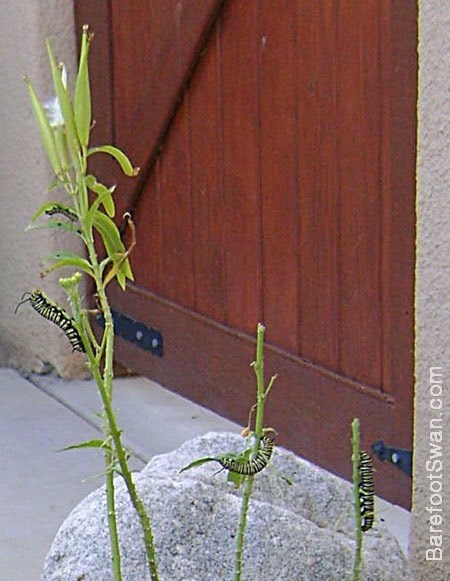 The Monarch Caterpillars are starting to disperse too. 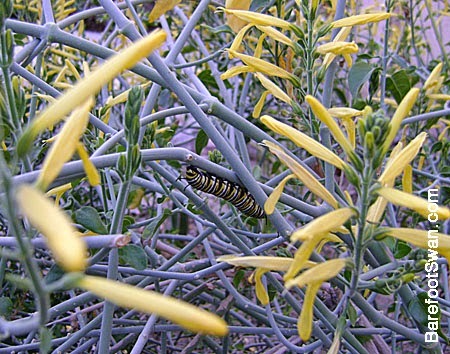 A few have moved to the nearby Desert Milkweed, and continued munching there. This one was deep inside our yellow Chuparosa bush. We have also found them on our front door, crawling across the stepping stones in our courtyard, and climbing on the landscape boulders. "If you make an error, use it as a stepping stone to a new idea you might not have otherwise discovered." This past weekend we noticed 10-12 colorful little caterpillars dining on our Golden Butterflyweed bush. 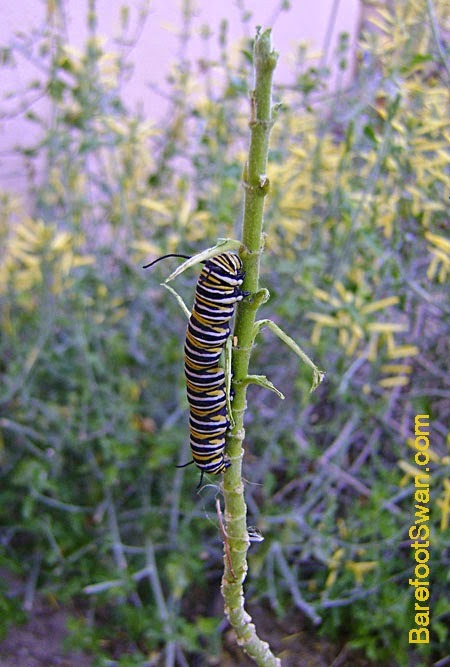 We recognized them as Monarch caterpillars, with their narrow, even stripes in white, black and yellow. 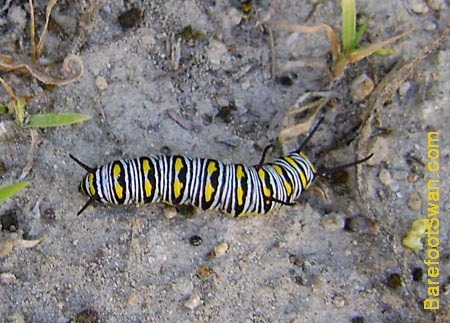 These other caterpillars have the same white-black-yellow colors, but they have some wider black markings with a yellow spot in the middle. Sort of like an eyeball. They also have three sets of black antenna-like filaments, instead of the Monarch caterpillar's two sets (one fore and one aft). We took some pics and consulted our butterflies field guide. 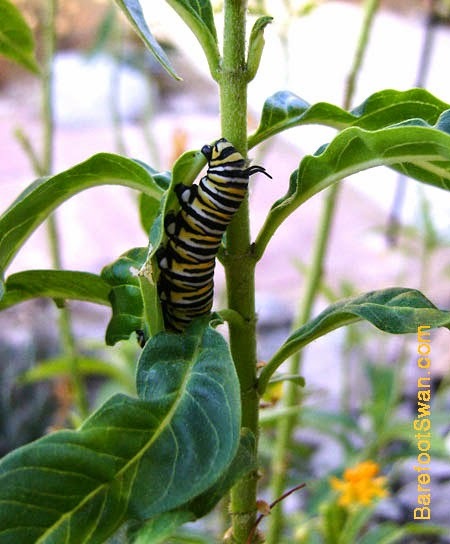 Our original blog post about Monarch caterpillars was March 4th of last year. So this year we are seeing caterpillars nearly a month earlier than previous. Not sure if it is the weather, the timing when the eggs were originally laid, or something else entirely. "You can be the king, but watch the queen conquer."